Azureus is one of the most popular Internet peer-to-peer platforms, that provides an easy and cost-effective way to distribute high-quality media to very large audiences. 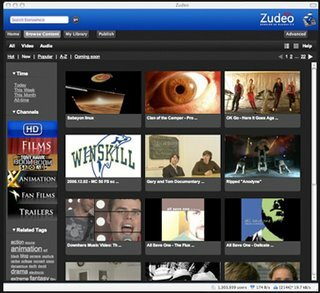 Azureus 3.0 is a new vision, that joins movie and music fans with filmmakers and artists to create a rich, social, and completely new entertainment experience. You need download a software from its site, you can use it to find very good quality video or publish your video.